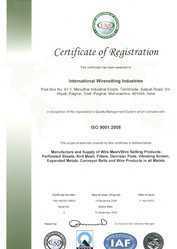 International Wirenetting Industries (An ISO 9001:2008 Certified Company) was established in 1985 and is hailing as the manufacturer and exporter of various types of Wire Mesh, Conveyor Belts & Industrial Screens. Our product line includes Wire Mesh, Stone Falling Wire Mesh, Industrial Wires. Our products are regarded by our revered patrons for being dimensionally accurate, cost effective, resistant to thermal expansion, precise in size and durable. We harbor a sound infrastructure equipped with high end machines for manufacturing a wide range of products in sync with the norms of the international standards and latest market trends. Our quality assurance unit is efficient and follows strict parameters of quality control for checking the raw materials procured from authentic vendor base and manufactured products. We have a spacious warehouse for storing bulk orders conveniently and free from dust and moisture. Our team of professionals is our biggest asset, owing to their impeccable skills and specialization in their respective forte. The team includes engineers, technicians, quality controllers, warehouse personnel, packaging personnel, transportation personnel and sales executives. Their committed efforts have enabled the firm to capture the market globally and manufacture customized products for meeting with all the requirements of clientele. Our constant source of inspiration is our mentor, Mr. Vimal Jain. His managerial expertise has streamlined the production process and enabled the firm to offer a comprehensive range of products to our revered patrons. The team has learned to work in coordination through his immense experience. We exports our products in various countries as UAE, Bahrain, Kuwait, USA, Australia, Dubai, South Africa & Bankok. 2011-12 Rs. 2 - 5 Crore Approx. Our team of professionals is dexterous and committed towards their goal. We have engineers, technicians, quality controllers, warehouse personnel, transportation personnel and sales executives. They work in coordination with each other for maximizing the production procedure and maintaining our clientele for longer durations. Our team has enabled us to manufacture a wide assortment of customer oriented products that are in tune with the latest market trends. Their constant efforts have made us a distinguished name in the industry. Our products are cost effective and are delivered within the stipulated time period. We are among the celebrated names in the industry for manufacturing and exporting a wide assortment of optimum quality products, which are in compliance with the norms of international standards and prevalent market trends. Our product line is manufactured by incorporating cutting edge technology machines and checked thoroughly for quality assurance by a team of experienced quality controllers. Our infrastructure is equipped with cutting edge technology machines for manufacturing a wide assortment of superior quality products. We have a sophisticated quality assurance laboratory for ensuring the quality of manufactured products and procured raw materials. Our systematic warehouse has enabled us to handle bulk orders conveniently as it is spacious and free from dust and rodents. We are specialized for handling customized orders and are prompt with deliveries, owing to our transportation facility. We are engaged in the industry for manufacturing and exporting customer oriented products. The product range is appreciated for being durable and in compliance with norms of international standards. The products are manufactured in cutting edge technology unit and checked thoroughly by diligent group of professionals for assurance of quality. We are specialized for handling bulk orders, owing to our spacious warehousing and efficient transportation network. Our aim is to capture the market globally by catering customized solutions to revered patrons.